Please copy and paste ' [[Category:Characins]] ' into the end of your article to include it in this category. The Characidae or Characins are a family of freshwater subtropical and tropical fish, belonging to the Order Characiformes. They originate in the Americas from southwestern Texas and Mexico through Central and South America. They vary in length with the smallest growing to a maximum length of 1.3cm (0.5"). There are over 1,000 currently recognised species in this family. It is ever-changing however, see below. To some extent the family has served as a junk-basket category in the past. More recent revision has moved many former members of the family into their own related but distinct families - the Pencilfishes of the genus Nannostomus are a typical example, having now been moved into the Lebiasinidae, the assorted predatory characins belonging to Hoplias and Hoplerythrinus have now been moved into the Erythrinidae, and the Sabre-Toothed Fishes of the genus Hydrolycus have been moved into the Cynodontidae. There is still much revision needed, but progress in this area is being maintained at a steady pace. 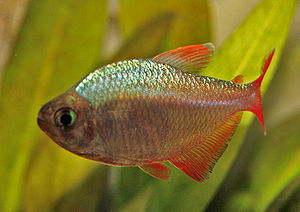 To confuse more, Alestidae are a family of African Tetras belonging to the same Order. There are around 100 species within this family. 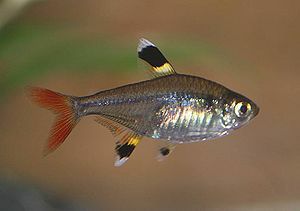 Among those fishes that remain in the Characidae for the time being are the tetras, comprising the very similar genera Hemigrammus and Hyphessobrycon, as well as a few related forms. These include the cave and neon tetras. 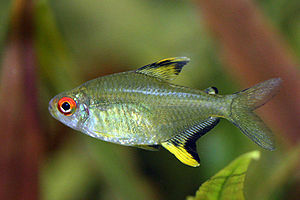 The larger Piranhas were originally classified as belonging to the Characidae, but various revisions place them in their own related family, the Serrasalmidae. This reassignment has yet to enjoy universal acceptance, but is gaining in popularity among taxonomists working with these fishes. Given the current state of flux of the Characidae, a number of other changes will doubtless take place, reassigning once-familiar species to other families. Indeed, the entire phylogeny of the Ostariophysans (fishes possessing a Weberian apparatus) has yet to be conclusively settled, and until that phylogeny is settled, the opportunity for yet more upheavals within the taxonomy of the Characoid fishes is considerable. This page was last edited on 19 October 2015, at 14:21.